I'm confident in further declines this week, but I'm not confident either way on the open. So I'm basically going big short as soon as it opens. At the moment I'm a little short. I don't have a solid selling point in mind. Maybe at some Armstrong targets, one is like 17300, and the other one is around 17,800 (for the DOW). The time will also be important. I trade SPX because it's easier. I probably won't bank on a turnaround at that lower line where it turned around on Friday. That was just a dead cat bounce. I will probably look for 2-3 half hour blocks at a steady price to guess that it might be turning around. If it hits the upper line that I posted about previously (connects highs 8-15, 9-7, 9-22, and others), I might even go all in. It broke that upper line for about 2 hours intraday once. That line has been rock steady, while the support lines look like they are about to give. I will certainly post when I sell. If it opens lower, I suppose I'll go short, but not huge. I meant to grab a daily chart. Oh well. 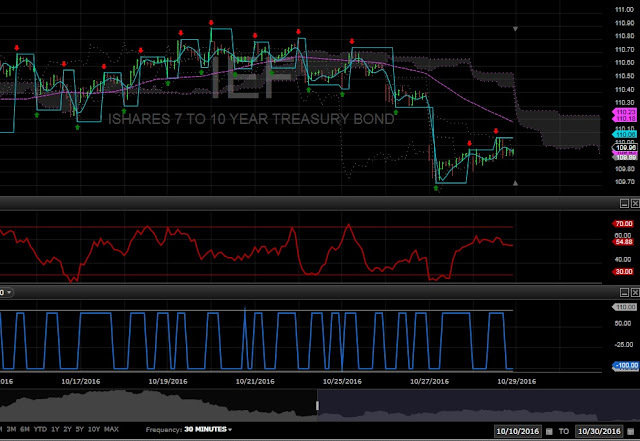 If we are "watching the bond market" It's a sell both on this and on the daily. I don't know if these are supposed to trade together or not, I think the answer is sometimes. In the near term, bonds selling off raises rates which put pressure on stocks, according to Mannarino.